We consider our cats our children. We once spent $1,000 to cat-proof a back yard so Jack and Opie could roam outside — without escaping to the dangerous world beyond the fence (the life expectancy of a cat is several times longer if it doesn’t run free). Our guys have a variety of cat furniture, and they eat food that costs more than $7 per pound. Maybe you spoil your pets, too. But that doesn’t mean you can’t find ways to save money on pet care. For example, you can buy expensive food, but on sale. You can build elaborate (or simple) pet furniture, instead of paying a fortune for it. Here are some more ways to save money on your pets. If you haven’t yet chosen a pet, consider smaller ones. A small dog will cost you $295 less per year than a large one ($580 versus $875), suggests ASPCA data on pet care costs. That’s even less than a cat ($670 per year), partly because of the cost of cat litter. Of course, you could consider even smaller animals. You’ll spend an average of $200 per year on a small bird, and just $35 on a fish. Note: First-year costs for all pets are substantially higher than the figures given above because of one-time costs like spaying or neutering, and buying pet carriers and other equipment. The breeder price for a dog is typically three times higher than the cost of adopting one from a shelter. You might save hundreds getting your dog or cat from a shelter, and you could also save a life. Over 2 million shelter animals are euthanized in the U.S. each year. We adopted Opie from a shelter, and Jack adopted us when he was finally ready to upgrade his alley-cat lifestyle. I just received a $5 gift certificate from Petco, because I used my Petco Pals Rewards card for the last $100 in purchases there. I bought food that was on sale (rewards card required, of course). Most of the major pet supply retailers have similar programs. Sign up for several if you shop in more than one place. You can buy discounted gift cards on a number of good websites. Most carry cards for more than one pet supply chain. We buy expensive cat food, because there’s a difference in quality. And recent evidence linking canine diseases to grains in dog food suggests you could make your pet sick and have future vet bills if you go too cheap. But even the best pet foods go on sale, so why not stock up when it costs less? 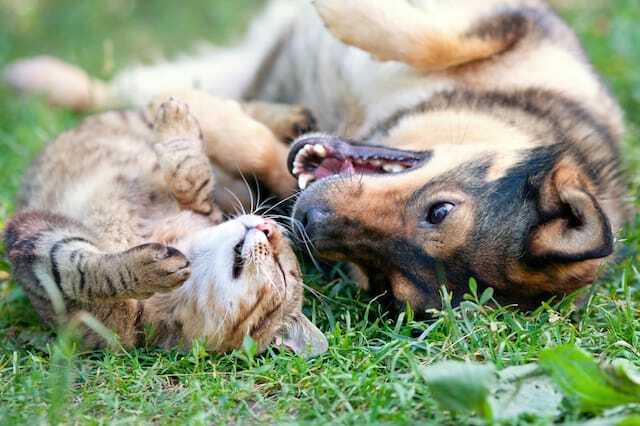 You can find weekly ads for pet supply retailers online. You can also link your email address to your customer loyalty card to get sales alerts. What do baked carrots, steamed broccoli and boiled eggs have in common? They all cost less than cat food (at least the stuff we buy) and they’re all safe and healthy for cats to eat, according to Animal Planet. WebMD has a list of people foods your dog can eat, but you’ll have to do the math to see which ones will save you money versus buying your regular dog food. To really reduce the cost of pet food, try deal-stacking. For example, I recently bought our usual brand of cat food at Petco using a coupon, while it was on sale. And, I paid with an American Express card with an “Amex Offer” for a $5 statement rebate. Or, buy discounted gift cards and use them when there’s a sale — a simple strategy that could make a good sale even better. We discovered early on our cats refuse their food if it’s too old — and then we have to throw it away. Even if we just overfill their dishes and the remainder sits there overnight, they won’t eat it. It’s probably less healthy by that point anyhow. Check the expiration date for your pet food, dole it out a little at a time and store it properly to keep it fresh. We prefer to use up our cat food months before the expiration date. We store it tightly wrapped in the refrigerator. The cats like the food better this way (yes, we tested), and we save money not having to throw away any of it. You spend money upfront to spay or neuter your pets, but there are long-term savings. For example, some of the negative behaviors associated with not spaying or neutering dogs and cats can be expensive. Unspayed cats can damage furniture and carpet spraying urine on them to attract males. Unneutered dogs can be more violent, leading to possible lawsuits if they attack people. There’s also the obvious huge cost of not fixing those pets: puppies and kittens. The worst time to find an affordable vet is when you have a medical emergency. If you love your pets, you’ll pay whatever it costs in the moment. To lower the cost of routine and emergency pet care, choose an affordable vet before you need one. Use websites like VetRatingz.com to avoid bad vets (we can tell you from experience, they’re out there). Call the acceptable ones and ask what they charge for a basic checkup, vaccinations, teeth cleaning or other procedures. If you have an idea of what services your pet might need, ask about those. In any case, ask about a few different services so you get an idea of the general price level of each veterinary office. In our experience, everything from cat toothbrushes to flea collars costs more at the vet’s office. You’re better off buying anything you can at a pet supply store, including any non-prescription medications or treatments. Many pet medications are cheaper online. Pet health insurance can save you from unexpected and large vet bills, but most pet medical procedures aren’t nearly as expensive as their human equivalents. Try saving money for your pet’s eventual medical needs. Consumer reports analysis of pet insurance found it overpriced. It concluded most pet owners are better off simply saving money for emergencies. Pets benefits from exercise just like humans. It helps keep them healthy and avoid obesity, which means fewer vet bills for you. Why buy pet furniture when you can make it for a lot less? We buy toys for our cats at least a couple times each year. Sadly, the result is almost always the same: What seemed so cute and fun is completely ignored by Jack and Opie. The good news is they love almost everything we make for them, especially paper balls and anything involving string. Moral of the story: Why spend a fortune on unwanted pet toys when you can make better ones? Want to provide a fenced area for your dog or an outdoor “catio” for your cats? You can see one of my own creations in my post about building cat enclosures. More recently, I fenced in a patio area and cat-proofed it for $450 ($140 just for a building permit). The lowest quote I got before going it alone was $950. There are plenty of online tutorials online on how to build your own dog fence, and you can check out photos of cat enclosures for ideas. Professional pet grooming prices run between $20 and $100, depending on the size of the animal (cats are in the middle of that range). But there’s no reason you can’t comb, wash and clip nails yourself. Not only will you save most of the cost (you’ll still spend a little for tools and shampoo), but grooming is another opportunity to bond with your beloved pet. Pet sitting prices run from as little as $15 for a stop-in visit to as much as $100 for overnight stays. We’ve paid $50-$60 per night for cat-sitters many times over the years. Find a broke friend you trust who’ll work for cheap. My friend would stay with our guys for $20 per night if I left a few beers in the fridge. Trade pet-sitting duties with friends and family to get your cost down to zero. Basic puppy training at PetSmart costs $119, and it’s just one of many classes they offer. Instead, read one of many books that help you train your pets yourself. Free online resources can show you how to train your pets and teach them tricks — even how to train your cat to use a toilet. Looking at all of the tooth marks on our lamp cords, I’m not sure how Opie survived his first years with us. Luckily, we learned a few tricks to break this bad habit, like hiding the cords as much as possible and putting two-sided tape on them to scare him away. The American Humane Association even has a list of ways to pet-proof your home. Preventing damage to your things and avoiding vet trips with simple pet-proofing will save you money and possibly your pet’s life. Your Turn: Can you add to this list of ways to save money on your pets?